It was the phone call we had been hoping for. Two months of interviews with a church, and desperate cries for clarity had been the daily rhythm for our family of seven. Just days before, two lead Pastors and their wives flew in to spend the day getting to know us. We were sure that God was connecting the dots for this job to be our new reality. How is it possible to remain consistently hopeful for such an exhausting amount of time? God was surely ahead of our story and I was right where He wanted me…finding Him consistently present in the unknown. I have sought Him out in fresh ways and would never wish this season away, but I’m telling you that the stress seemed to dominate our days. 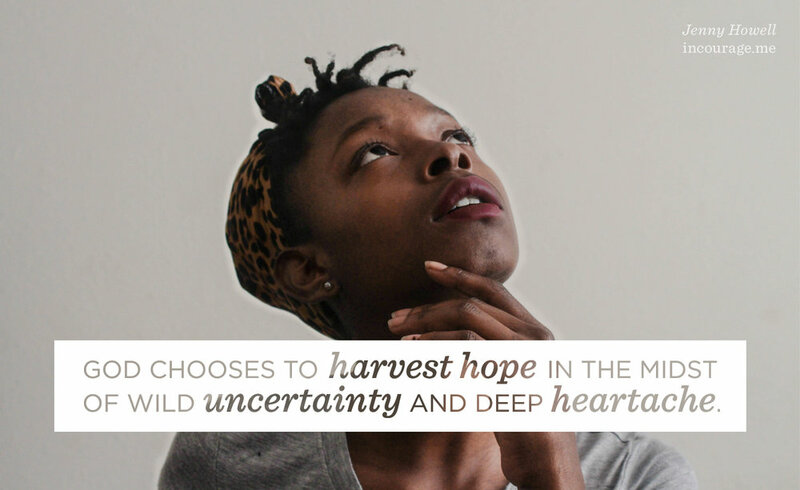 I am learning that the hard times harvest hope. When we sow seeds of trust, the Spirit gives us everything we need for living victorious one foot in front of the other. The dark days of waiting are where we practice being fully at peace with where God is taking us. I am surely not amazing at this…you? Honestly…I was over all the hoping and trying to keep my family above water. Well, lets just say that the morning was relaxing and off to a beautiful start. My people were already playing in the pool and music from the jam box may have woke up all the neighbors earlier than they’d like. Conversations were all over the map as our teens dreamed out loud about a possible move to Colorado, between cannon balls and sunscreen. To finish reading, hop on over to (in)courage today and join me! Hope to see y'all there. You will want to sign up here to receive daily encouragement from the writers of (in)courage right to your inbox! It's a perfect way to start your day friends.